Who might want it? Beginners to looping. Loopers looking to upgrade from an entry level device with one loop. Experienced loopers looking for a portable alternative to their large rig. Sonic experimenters who like oddball gear. First thing to do with a new looping device is plug it in, you’ll have no problems tapping in that first loop, just 2 presses of the same easily accessible foot-switch (“Rec/Play/Overdub”). A second switch (“Stop”)lets you stop the loop with a press, and once stopped if you hold the switch down the loop is erased. Hence to re-record a loop that you’re not happy with is far from a seamless process, and very far from the ideal of simply being able to hit a switch that starts a new recording right away. Another slight down point is that the loop won’t stop until you release the switch, not a problem when you get used to it. Once stopped the loop can be restarted with the Rec/Play/Overdub switch. There’s also three alternate “Stop Modes” available if you don’t want the loop to stop right away, either it can play to it’s end before stopping, the loop can fade or the loop can stop a with delay applied. The fade ends somewhat abruptly, but works well enough. A third switch (“Trigger/Tap”) let’s you re-trigger the loop from the start, quite an advanced feature which is very welcome. Going back to the Rec/Play/Overdub switch you can overdub on a loop that’s playing. Vox claim that infinite overdubs are possible without loss of quality, but this is not the case, the simple test of leaving the Overdub on while the loop plays shows significant degradation of the loop after 20 repeats or so. As there’s no feedback control the “infinite” claim is highly misleading, and the fact that feedback isn’t dropped automatically during overdub shows that Vox didn’t do their research on this matter (other manufacturers have been doing that for years). On the plus side the Overdub has an Undo and Redo function which will work even on the longest loop times. However many layers you make in an overdub it’s possible to cancel them all at once, and then bring them back at will. Once you start a new overdub the old one is either lost, or permanently added to the backing. The forth (and last) button (“Program Up”)has to be held down to achieve this, luckily it’s still possible to get timing accurate as the Undo or Redo doesn’t occur until you release the switch (full marks to Vox for thinking about this). So, this is not a looper which will allow to continuously add layers, rather one which let’s you control distinct overdubs. In line with this, it’s not possible to go straight from recording into overdubbing. Already we’ve see a couple of instance where a foot-switch doesn’t operate as soon as it’s pressed. This may seem pointless but in fact it’s necessary in order to control a lot of functions from just 4 foot-switches. Most significant of those extended functions is the ability to switch to a second loop with all the features of the first. To get to loop 2 you need to press 2 buttons simultaneously, not as easy as you’d like and needing a sensible approach to footwear, but easily mastered with practice. If loop1 is running when loop 2 is recorded then loop 2 will be adjusted automatically so it’s length is a multiple of loop1. That’s a very welcome feature which you might expect on a much advanced product, but which works in a slightly different way. Standard practice is to always round up the length of the new loop so you don’t lose any of your new material, whereas the Vox will round to the nearest fit. A bit surprising but not a problem. If you’ve just record something without rhythm in loop 1, and want to create a tight groove on loop2 that’s possible too. Just end the recording by hitting the Trigger/Tap switch and the rounding is disabled. Another option is to use the on-board metronome. For timing practice this has an audible sound which can be adjusted in volume, and also some of the pre and post loop effects are synced to it. Once the metronome is started by tapping the Trigger/Tap button in your favoured timing any loops recorded will sync their length to the specified bar length, which can be anything from 1 to 100 beats. The metronome sound probably isn’t something you’d want to be hearing unless you’re doing timing practice, so to get your timing for the loops it’s easy enough to engage one of the time synced pre-fx as a guide. More about them later. The default metronome bar length is one beat, and with that setting it’s very easy to set up loops 1 and 2 in a poly-rhythmic relationship. This is something that a lot of the more sophisticated users will like. Generally once you’ve switched away from a loop you lose control of it, but there’s a couple of extras available in this respect. If the current loop is stopped, a second press of the Stop/Start Button will stop the other loop. To start both loops at once you can hold down the Stop button and hit Rec/Play/Overdub. Do that same combination when the current loop is playing and you can start the other to play with it…and with a few hours practice of that manoeuvre you’ll even get the two loops in time with each other. This is very welcome if a bit awkward, and there’s also the worry that holding Stop for a fraction too long will erase your loop. There’s no way to stop the unselected loop while the selected one is playing, and there’s no way to stop both loops simultaneously. 1) Press the STOP MODE button a few times until the GREEN mode is selected 2) Start recording on LOOP1 and then press REC/STOP/OVERDUB to stop recording and start playing back 3) Press STOP (which set LOOP1 to play until the end and then stop) 4) Move onto LOOP2 and press REC/STOP/OVERDUB (when LOOP1 stops playing at the end of recording) to start recording LOOP2 In the case above, LOOP2 can have a completely different length or chord progression. You should then be able to seamlessly switch between the LOOPs by pressing STOP before moving onto the other LOOP. I’d have to say I didn’t consider that to be “switching between phrases”, more like “you can start one loop when the other stops automatically as long as you’re very quick and accurate with your feet”. It’s a real shame Vox didn’t do a bit more work on this which after all is a feature that most other manufacturers seem to be able to provide. I did find other ways of going from loop to loop, including a simple improvement to the above instructions, but nothing easy enough for someone who simply wanted to create a simple verse chorus structure. One extra point about the two loops, the Undo/Redo function on each is totally independent. You could make an overdub on loop1, undo it, go to loop 2 and repeat the undo/redo process as much as you like…then come back to loop1 and Redo *that* overdub. Albeit in a limited way it’s bit like having 4 tracks available! 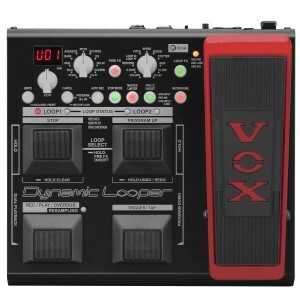 The loop fx accomplish more than you would be able to do by simply running a loop pedal into an fx unit, about half of them are specific to looping. “Volume”. Here the pedal can be selected to control volume of either just the current loop, both loops or everything being output. In itself that’s handy, but as switching on any post effect engages the Resample things get suddenly very interesting. When you Resample a loop (hit REC/STOP/OVERDUB) you can make the length an exact multiple(hit REC/STOP/OVERDUB again) or any odd length you like, including just picking a small section of the loop (hit Trigger/Tap). On a high end loop device this would be called Multiply, it’s one of the most useful loop techniques available and this is the first time it’s been seen on a device at this price point. Additionally, if you’ve synced the loops to the metronome then re-sample can be used to change time signature easily and accurately. Volume as a re-sampled effect also allows you to mix both loops onto one, after which it automatically stops the non-current loop for you. That’s a nice touch, as you don’t want that loop to continue once it’s been re-sampled. Obviously a re-sample eradicates any overdubs waiting to be Redone. What’s missing, of course, is any other way to control the volume of the loops. In practise you can learn to play at the right volume so the mix works out, but this is the first loop pedal I’ve found not to offer such a basic requirement. “Cross-Fade” lets you fade from on loop to the other, and again it’s re-sampling that makes this very interesting. “Reverse” works in one of two ways, controlled by the foot-pedal. As you’d expect, you can simply send the loop into reverse from it’s current position, but also you can cross fade between forwards and backwards versions. That second option is great if yo don’t want to put one loop out of sync with the other. It’s not possible to go directly to reverse on the completion of recording a loop. “Speed” gives you double speed and half speed playback, up or down an octave, and also does time stretching over the same range. 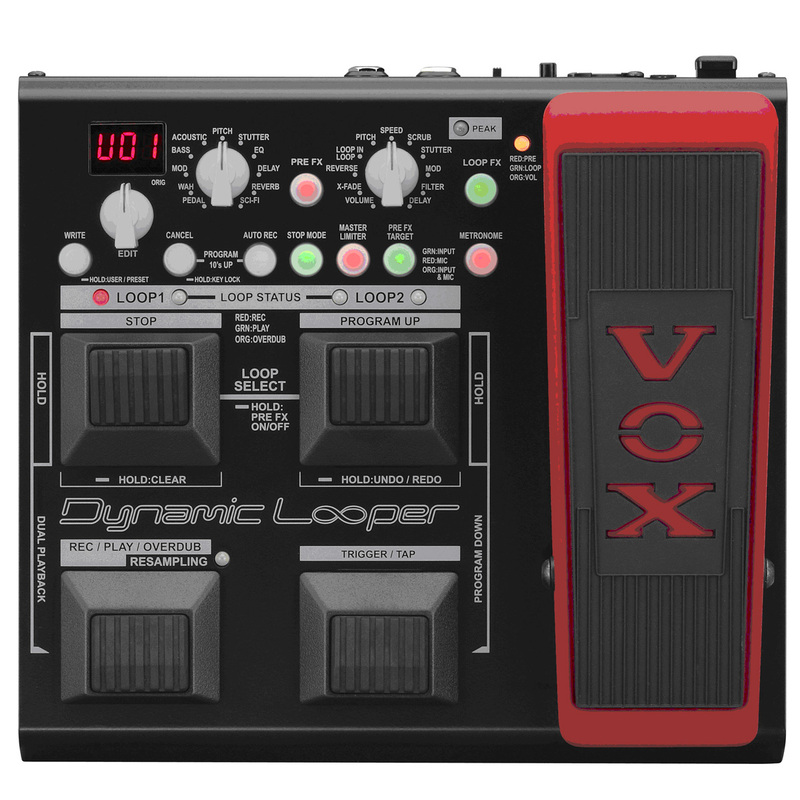 If you’re used to other loop devices then you’ll likely notice that the Vox doesn’t go into the speed change instantaneously, because you need to activate it with the pedal which sweeps the range. This means you can’t, for instance, double speed loop2 and still have it in time with loop1. “Loop-in-Loop” will repeat a short chunk of the loop from the current position. Sadly this doesn’t time sync with the loop, only with the metronome, so to make full use of it you have to record using the metronome (see above). “Pitch”. The default setting, heel down on the pedal produces no pitch change, pushing the pedal into the mid range gives you a 4th up, and toe down gives you a 5th up. Sound quality is as good as could be expected for a pitch shift that can work on a polyphonic signal and this really is very usable in a looping context, although the temptation to turn that riff into a 12 bar blues is maybe too great. There are some other pitch combinations available, as well octaves up or down as a whammy effect or by semitones. “Scrub” I know there’s folk who are going to love this. Regular playback is suspended and playback is of repeated chunks of sound taken from a place in the loop based on the position of the pedal. Chunk size is variable by a knob (after hitting loop fx button). Like all post-fx it’s possible to re-sample the result. “Stutter” Harsh gating synced to the metronome. “Mod” a flanger. Pedal controls resonance. “Filter” Low pass, high pass, band pass selectable. Pedal controls frequency. With variable Q over a small range. “Delay” synced to metronome, pedal controls delay volume and feedback together. If you stop the loop, the delays stop abruptly. Turning off the loop fx can be done by hitting Retrigger/Tap. Unfortunately this also has the result of retriggering the loop with a noticeable delay, a bit of a concern for anyone needing rhythmic accuracy. This is surprising, as ordinarily the Retrigger doesn’t have this problem. One alternate method to switch off loop fx is to use the loop fx button (fingers only), but I found that switching to a new preset (Program Up) works best. In this case the loop isn’t re-triggered. …and so on to the pre-effects, concentrating more on those that are useful for looping. Like the loop fx, these aren’t very tweakable, certainly less so than you’d expect in all but the cheapest of multi-fx. However there’s some gems here if you’re prepared to work your way through. “Pedal”. Pedal controls volume, with options for fixed preset Compression, Overdrive(sic), Crunch, Distortion. Only adjustment available is a volume( in addition to pedal). In any case, when when pre-fx are switched off pedal can always control volume. “Wah” model of Vox wah , with adjustable volume…nice. “Mod” the usual Chorus/Flange/Phase/Trem, unsynced. “Bass” one thing that’s very handy for a loop guitarist is a regular sub octave effect, but that’s not on offer here. The closest to that is a “model of a bass guitar” which somehow sounds like the guy who’s only in the band because his brother owns the pa. There’s also a sub bass synth sound, great if you wanted to add deep mmumff mmmunnf type sounds. Best of the bunch is a modelled Moog type synth sound, it tracks the entire range of the guitar well and sounds a whole lot better than any other similar effects I’ve tried. Also it responds really well to the loudness of the note. Only downside with this is that it’s not an octave down, so doesn’t really qualify as bass…but it’s definitely a personal favourite. These two synth bass sounds also work well together, maybe that’s what the designers intended. Tracking for the bass sounds doesn’t work on the low octave of a bass guitar. Pedal controls volume, and oddly there’s no other control. “Acoustic” a few of the usual multi-fx type sims, the resonator guitar is quite fun. “Pitch” If you couldn’t find that bass sound in the bass section, then dial in an octave down and mix with the dry signal. “Stutter” just like the post fx. “EQ” very limited, but might be useful. Lacks the obvious low mid cut that you’d need for an SM58 type microphone. “Delay” A whole 2 seconds delay that can sync to the metronome, so with metronome sound turned off it’s a tap time delay. There’s 3 flavours of delay, digital which is the only one which “goes forever”, analog which loses highs quite quickly and tape, which can sound rather woozily out of tune. As 2s is enough for looping, this can be a good place to to start a piece, just working with delay until something worth keeping turns up. As the looplength and delay can both be synced to the metronome and complex arrangement can be easily had. Playing with the delay time produces some great pitch bends which get trapped in the loop, might be just the thing for someone trying to get a hip-hop vibe. Pedal controls delay volume and feedback together. Note, tap time only works if both loops are erased. “Reverb” select Spring, Room, Hall and adjust volume with pedal. No other adjustments possible. Spring sounded ok on guitar. “Sci-Fi” the oddball stuff that wouldn’t fit elsewhere. A slow attack effect. Some harsh resonant drones. A couple of synth sounds, one of them not bad. A strange drum synth thing which pedals between an electro handclap and some of those sounds which you’d recognise from early drum machines but never new what they were meant to emulate. Overall the effects are something of a mixed bag, with inspiration, disappointment and “good enough to make do” about equal measure. Only having a single effect available at a time is going to produce frustration, best to see the effects as a bonus feature on what is essentially a loop pedal. It’s certainly possible to pick out some different tones to keep the layers in the loop distinguishable. Having both pre and post fx depend on the expression pedal has it’s downside, to switch from controlling the pre to post fx you have to go toe hard on the pedal. This of course leaves the pre fx in it’s maxed out setting…not so clever, especially as some sounds, like distortion, will be made overly loud, and of course delay goes into runaway feedback (confirmed by tech support, but this isn’t in the manual). It’s possible to store your effect settings in 50 presets which can be accessed by scrolling them through with the “Program Up” button (program down is done by holding Program Up while hitting Trigger/Tap). That’s probably the best way to get to the sounds that work for you easily. Loading a preset engages the pre fx if it was on when saved, and also changes the assignment of the expression pedal to pre or post. It doesn’t switch on the post fx though, you have to do that by moving the pedal. Metronome settings are not stored in the presets, those just stay where you put them even after re-boot. One feature I couldn’t see the point of was the master limiter, it’s supposed to balance the volume of the 2 loops and the input but to be honest all I ever heard it do was make the loops louder at the expense of the live input. Sound quality seems pretty good, and the mic input works well. Incidentally it is possible to put the pre fx on the mic if you want. Build quality is solid, except for one thing. It’s not that difficult to dislodge the foot-switches, and if you do there’s a spring that’s easily lost. Vox tech support says that spare parts are available, and that the foot-switches don’t have this problem, however I managed to accidentally dislodge a switch during use. I’ve never had that happen before with any other switch, and I’m known as a “tap dancer”. The response of the switches is good enough to get accurately timed loops, although they don’t make contact until the end of their travel so they’re not as good as they could be. They operate nice and quietly, a useful consideration for anyone playing at low volume. An easy modification is to remove the spring from the foot-switches, which instantly makes them much more responsive. Incidentally, Vox tech support via email is very good and prompt, although at time of writing the tech support guy doesn’t have access to a VDL-1 and is unsympathetic to questions he doesn’t understand. The manual is generally excellent. One thing it won’t tell you is “which loop is the effect applied to”, so here’s the info: Loop fx are applied to the loop which is current when the loop is switched on, and will continue to work on that loop as long as they are left on. Stopping a loop automatically switches off the loop fx. Plus Points. The two loops open up a lot of possibilities, especially as they can be of different length. Re-sample allows you to multiply the length of a loop. Easy portability and small footprint will appeal to experienced loopers who don’t want to haul out the big rig for a small gig. The Undo/Redo allows you to make complex arrangements. 2s delay can be as an auxiliary synced loop. No shortage of weirdness for those who like that sort of thing. Minus Points. Not practical to use for Verse Chorus structures despite this appearing to be on offer. Using a small number of controls for a large number of features inevitably makes many features awkward to access. No way to independently control the volume of the loops. No feedback control. Claim of “infinite overdubs” is untrue and misleading. Effects only sync to metronome, not to loop directly, and can’t be tap timed once loop is running. Conclusion. To assess the VDL-1 it’s necessary to to consider what it is, it’s not a fully fledged multi-fx with a looper tagged on, it’s a looper with a few effects thrown in. The lack of loop storage is no disadvantage to the live looper, and 90 seconds of loop time is plenty. Vox have obviously put a lot of effort into making this, in effect, a playable instrument. Equally it’s very apparent they didn’t research what is possible and popular on existing loop devices, or ask any expert users for comment. If they had then two part song structures and a feedback control would have been obvious additions. It has the capability to create complex arrangements well beyond what people would expect of a “loop station”. To get the most out of it will take a bit of effort and creativity, and an acceptance that some things just aren’t possible, but it certainly has enough going for it for me, and maybe you, to do a show with just one pedal.